Calling all potato lover, U.S. Fries Fiesta is happening from 15 June 2017 to 30 July 2017. Do you know that U.S. has the widest range of potatoes? Plus, potatoes are an indispensable source of nutrition. One 148 gram potato packs only 110 calories, but 18% of the RDV (recommended daily value) of potassium and 45% of the RDV of vitamin C, that is rich of nutrients for sure. I can’t wait to taste all the unique and creative U.S. Fries menu using U.S Frozen Wedges, U.S Hashbrown, U.S Straight Cut Fries, U.S Crinkle Cut Fries and U.S Curly Fries at the restaurants above. So, it US Fries Fiesta time again? I want! Thanks for alerting me about the fiesta. 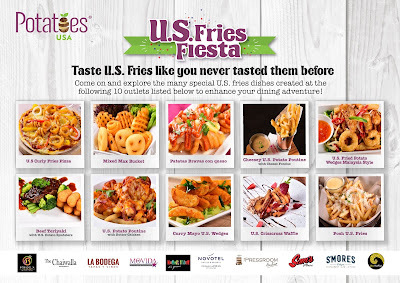 Can't believe is the US Fries Fiesta again! I didnt join before but can't wait for all the food they have!